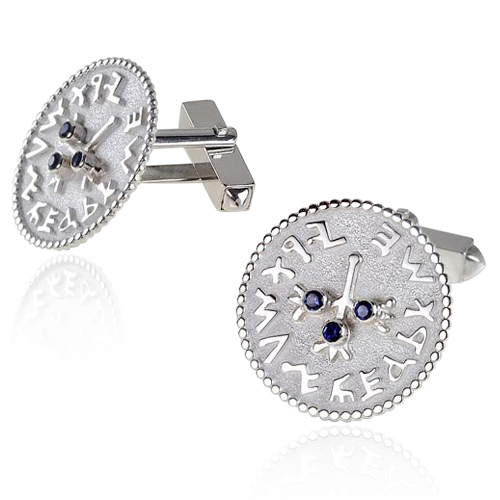 This elegant pair of 925 sterling silver cufflinks are round in shape, and are designed with archaic Hebrew letters along the edges of the cufflinks, with a three pomegranate connected design in the center, each pomegranate centred with a handsome deep blue Eilat sapphire. This serious pair of Sterling silver cufflinks are embossed with authentic ancient Hebrew letters scrollwork surrounding a three pomegranate design based on the Jewish love for fulfilling God's commandments, which are likened in their multitude to the multitude of seeds in a pomegranate. Each pomegranate in this piece of Jewish jewelry has a deep blue sapphire stone that lends it a real gravitas unreplicated in most other works of art. The original coin replicated by this piece was discovered at the Temple Mount Sifting Operation at Emek Tzurim on the Mount of Olives and dates to the years 66/67 CE. In the times of the Jewish Temple of old, silver "half shekel" coins like these were given each year by every adult Jewish male to the temple, to be used both for rough numbering of the Jewish people and for financing temple operations. The words written on it in archaic Hebrew letters read "ירושלים הקדושה" ("Holy Jerusalem"). The Sapphires used in this special Israeli jewelry by Rafael Saadia are mined in and around the city it is named after, the southernmost city in Israel, Eilat!